Wow, your kids have busy social lives -- who's their corporate sponsor? It may sound crazy, but it's starting to happen. Kids who are involved in a lot of after-school sports and activities tend to interact with lots of other kids, which has advertisers drooling and uttering their favorite words -- untapped market. 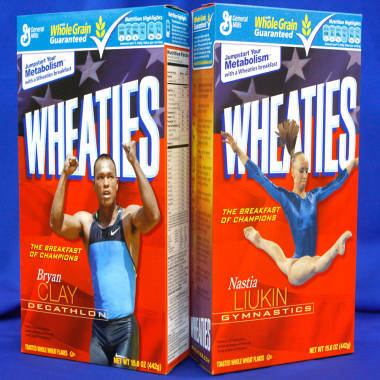 Some kids dream of getting their picture on the Wheaties box. But in England, a cereal company is paying kids to wear their logo. Weetabix, a popular cereal brand in the U.K. (think super-sized Frosted Mini Wheats, minus the sweet, frosted side), recently sponsored 15 kids from around England who have busy extra-curricular schedules. According to The Telegraph newspaper, the kids are each being paid £242.43, about $400 U.S., to wear special, Weetabix clothing on their busiest days of the week. While the company hopes to send the message that kids who eat Weetabix can pack more into their day than their non-Weetabix consuming peers, some are wondering if the actual message is that kids are for sale. Sure, Little Leaguers have long worn uniforms displaying a company's logo. But the Weetabix deal is an entirely different ballgame. Kiddie sports sponsorships are generally viewed as a civic duty as much as an advertising opportunity by the usually small, local companies that contribute. Additionally, that sponsorship covers an entire team of kids, usually to help offset expenses like field rentals and equipment purchases. But Weetabix has upped the ante by strategically targeting those children with jam-packed social calendars and paying them cold, hard cash. In exchange, Weetabix receives a walking, running and playing advertisement. While we haven't yet seen anything quite of this nature in the U.S., sponsorship creep is starting to hit kids here too. Disney got in on the act this winter, when it announced that the Mouse's legion of sales representatives were hitting up maternity wards, handing out free onesies to new moms willing to listen to a sales pitch and sign up for email alerts for the company's new line, Disney Baby. Earlier this year, the "Billboard Family" welcomed a new little bundle of revenue to the clan. A diaper rash cream company sponsored the birth of Alex Martin, who was photographed shortly after her birth, swaddled in a blanket with the company's logo. In fact, the entire family wore the logo for the joyous event, garnering them $730. Before you judge, consider that their family sell-out was born of desperation: They turned themselves into human billboards in 2009, after the father, Carl Martin, lost his job when the metal recycling company he worked for went out of business. Since then, the Martins have opened up their lives and their closets to sponsorship opportunities and are hoping to net $240,000 in 2011. Then there's Super Franks, a self-described family entertainment restaurant in California, (we're pretty sure they won't be banning kids under the age of six anytime soon...) which offers shirts printed with "SUPER FRANKS PAYS ME TO WEAR THIS SHIRT." In this case, kids pay Frank $9.99 for the shirt and a pizza meal, or $5.99 for the shirt, hold the pizza. Every time kids wear their shirts to Super Franks, they're given four tokens for the arcade. Not the lucrative deal the Weetabix folks are offering, but the offer's open to everyone, not just the kids with the busiest schedules. Would you be tempted by the Weetabix offer? While $400 isn't a lot of money to turn your kid into a walking billboard, it can cover the cost of activities kids want to participate in, and in these tough economic times, that can be hard to pass up. And what about the kids the living advertisements are paid to influence -- the kids who just happen to be on the same soccer team or scout troop as a kid with a sponsorship deal? Parents have long complained about Channel One, the news program for teens that is mandatory viewing at many schools, because it contains advertising. Are the friends of sponsored Weetabix kids a similar captive audience, exposed to advertising at a tender age? If you were offered the chance to dress your family in logos and slogans for a little cash on the side, would you do it? How would you feel about your kid going to soccer practice every week with a kid who was paid to wear a company's logo? Dana Macario is a TODAY Moms contributor and Seattle mom to two sleep-depriving toddlers. She is currently developing an alarm clock that will start an IV coffee drip 10 minutes prior to wake-up time. Once properly caffeinated, she also blogs at www.18years2life.com.